31 C. PRIDIE KAL. NOVEMBRIS. 31. 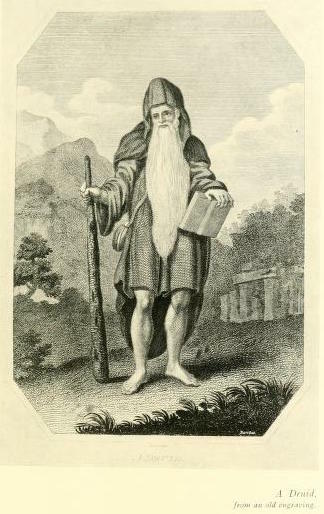 COMÁN, Ua Ciarain, Abbot of Lis-mor. COLMAN, Abbot of Lis-mor. The age of Christ when he resigned his spirit was 702. Comman, grandson of Ciaran, abbot of Lismore ... ... ... Oct. 31. Patrick Power, Waterford & Lismore - A Compendious History of the United Dioceses (Cork, 1937), 5-6. Colgan (Acta. S.S. 8 Jan.) says, "St. Ergnata flourished about the year of Christ, 460, and our Hagiologists relate, that her festival was celebrated in the Church of Cluainda-en (the meadow of the two birds), in the district called Fiodhbhaidh (Feevagh), and in the Church of Tamhlact-bo, both on the 8th of January, and on the 31st (recte 30th), of October." Colgan adds in a note that Cluain-da-en is a parochial church on the banks of Lough Neagh. Two transcripts of the Calendar of Aengus, read at the 30th of October, where it commemorates St. Ernach — "Ernach a virgin (uag) a high pillar," but the oldest transcript which Whitley Stokes gives, reads, "Ernach, a youth (oc), a high pillar." It is obvious that there were two saints, one a virgin, the daughter of the prince, who gave Armagh to St. Patrick; she was named Ergnata, or Eargnath, or Herenat, and was honoured on the 8th of January, with a festival in the Church of Tamlachtbo, in the parish of Eglish, Armagh. While there was another saint called by nearly the same name, though a man, who was honoured by a festival in the Church of Duneane, which was held on the 30th of October. In process of time, the hagiologists confounded the two on account of the similarity of names. Thus the Calendar of Donegal has, at the 8th of January, "Eargnat, Virgin of Dun-da-en, in Dalaraidhe," and again at the 30th of October, it has "Hercnat, Virgin of Dun-da-en, in Fiodhbhadh (Feevagh), of Dalaraidh." The note on the Festology of Aengus, in the L. Breac, sets the matter at rest. Ernach-i-MacTairnd, &c., Ernach, i.e. son of Tairnd, is his name, but it fitted not the quatrain; and in Dun-da-en, in Fidbaid (Feevagh), of Dalaraidhe, is he". Dun-da-en, the old form of the name Duneane, signifies "the fort of the two birds," in allusion to some old legend a version of which is given below. Feevagh is still the name of district adjoining Duneane. St. Ernach, whose festival was held on the 30th of October, in Duneane, seems to be the same St. Ernin, whose festival was held on the 31st of May, in Cranfield. Rev. James O'Laverty, An Historical Account of the Diocese of Down and Connor, Ancient and Modern, Vol. III (Dublin, 1884), 333-334. 27. Abbán, great-grandson of Cormac, i.e. from Cell Abbain in Hui Muiredaig and from Mag Ernaidi in Húi Cennselaig, i.e. in Húi Buidi; and a great-grandson of Cormac is he himself; and this is the feast of his nativity. Abbán, son of Laignech, son of Cainnech, son of Imchad, son of Cormac, son of Cucorp. Seventeen pure-shaped years, in addition to the number three-hundred, the age of Abbán, shapely lord, while he was in the body. ABBAN of Moyarney, County Wexford. An abbot who has been confused with Abban of Killabbban in Laois and whose feast-day is on March 16. They may have been the same individual, but there is no certainty either way. Tradition would suggest that there were two Abbans, while holding that there was only one; but if so he must have been singularly long-lived for he died in 630, yet is reputed to have preached before the coming of Patrick (432). It is probable that there were two Abbans, to-day's being the latter. He was of royal blood and, indeed, was imprisoned by his father because he chose the Church rather than the local kingship. He is invoked against shipwreck. 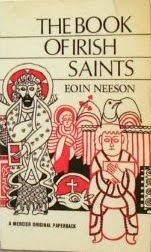 Eoin Neeson, The Book of Irish Saints (Cork, 1967), 190. Caoide, abbot, of Domhnach-Caoide, in Tir Eoghain, diocese of Derry, 25 Oct. (8 Cal. Nov.); Cadinus in Latin. His church, his bell, and his staff are preserved. 25. D. OCTAVO KAL. NOVEMBRIS. 25. Rev. W. Reeves (ed), Acts of Archbishop Colton in his metropolitan visitation in the diocese of Derry, A.D. MCCCXCVII (Dublin, 1850), 73. 24. C. NONO KAL. NOVEMBRIS. CAETI, Bishop. The Cain Adamnain states that Ceti, the bishop, was one of the saints who were security to free the women from every kind of captivity and slavery ; and it is likely that it is of him he speaks. St. Caide or Caidin, who was bishop at Hy, died in 711 and his name is in the calendars at 24 October. Rev. J. Lanigan, The Ecclesiastical History of Ireland, Vol 3., (2nd edn., Dublin, 1829), 153. The Martyrology of Marianus O'Gorman, incidentally, lists only Coeddi, a bishop, on 24 October and has no entry for another saint of the same name on the following day. So it would appear that there is some degree of confusion surrounding our Saint Caidin. It is of course possible that we are dealing with one individual here. Saint Caidin could have been both a monastic at a foundation of his own in Ireland and then later acted as a bishop on Iona. On the other hand, it would seem equally plausible that there could be two saints of the same name, one an abbot in the diocese of Derry, the other a bishop of Iona. The Iona Caidin of October 24 is clearly identified as having died in the early eighth-century, but it may be significant that the other Caidin of October 25 is associated with the placename 'Domhnach Caoide'. The prefix Domhnach is associated with the very earliest church foundations in Ireland, and indeed in The Tripartite Life of Patrick there is a Domhnach Cati listed as one of the seven churches of Saint Patrick at the Faughan River. Thus if we are dealing with two individual saints called Caidin, the one commemorated on October 25 who left his 'church, bell and staff' may be a very early saint indeed, and thus distinct from his later namesake of Iona. There are many saints of whom something must be said because they lived and died in Italy, where there are so many reminders of their culture and their teaching. They belong to the period of the scholars and the apostles, and were men who played a part in the political life of Italy. 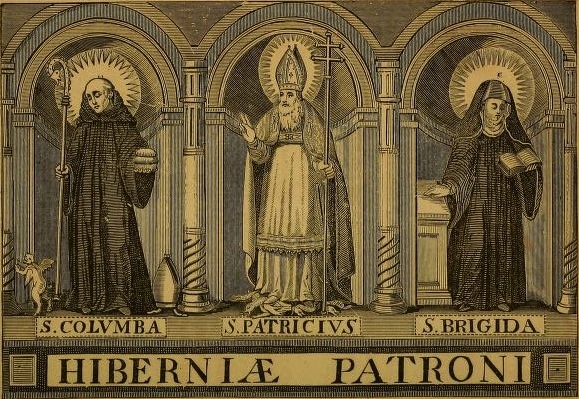 These scholars were almost all ecclesiastics who had been trained in the great monastic schools of Ireland; they were endowed with great strength of character and intellect, and were masters of every branch of learning - men who rendered great services to civilization on the Continent, especially during the Carolingian era. Not a few of these scholars after a period of teaching, deserted the courts of princes and the uncertainties of public life and entered the monasteries so as to enjoy that solitude which is the spiritual home of men of great strength of character. Although most of these learned men went to France, Italy attracted many who took part in the directly apostolic work of the Church. Such a one was St. Donatus who became famous both as a politician and a man of letters. He was Bishop of Fiesole for nearly fifty years and is a somewhat solitary figure, remote from the Carolingian world where culture was valued more as a means to acquire feudal and imperial prestige than as a method of attaining intellectual freedom. He had apparently studied and taught at the monastery of Iniscaltra; like many other monks he visited the Holy Places, being accompanied there by his faithful companion, Andrew. When he arrived in Italy he travelled to the tombs of the martyrs, the monasteries and the hermitages. At Fiesole he was welcomed by a crowd of the faithful "mysteriously gathered together in the Cathedral", who during this still more "mysterious period of waiting" acclaimed him as bishop of the vacant See. During his episcopate the learned Irishman had to face a precarious and dangerous political situation, for the property of the Church was pillaged by Saracens and Northmen who sailed up the Arno and even sacked the Bishop's palace at Fiesole. He was not called upon to do missionary work but he had to defend the rights of the Church against many tyrannical acts of partisan factions, and he did so with great ability and energy. As Bishop and feudatory of the Empire, he was present at the coronation of Louis II; he commanded his own vassals in an imperial expedition; he took part in company with the Pope and the Emperor in deciding an old ecclesiastical quarrel and he attended the Council in Rome summoned by Nicholas I. Having reached this eminence, he consolidated his temporal authority, rendering it independent of the imperial administration and acquiring - by an imperial rescript - fiscal and juridical rights. St. Donatus interested himself not only in politics and administration but undertook with equal success the post of professor in the school of Florence, where he proved himself to be a learned Latinist and a writer of verses. According to Davidson, he specialised in teaching and commenting on Vergil. In his verses, which served as a preface to the biography of St. Brigit, his miracle-working compatriot, he quoted Democritus and Hesiod. Even centuries after his death his poems were much admired. He also left a life of St. Brigit in prose, much fuller than that in verse. It contains some descriptions of Ireland which he praises for its richness, "the absence of savage beasts and poisonous snakes", and for the progress of its people in learning, in peace and in faith. It is related that when hear his death, St. Donatus appeared at a meeting of his brethren where he had to recite his poetic beliefs, which he did in terms of Virgil's eclogue, dying as he came to the last words. Papini declares that "like Augustine, the Emperor Constantine, Eusebius, Lactantius, Innocent III and even Abelard, St. Donatus believed that Virgil had announced the coming of our Saviour." During the last years of his life he built a church at his own expense in Piacenza and dedicated it to St. Brigit. This church he left in his will to the Abbey of Bobbio, with the obligation of maintaining a hospice for Irish pilgrims. The work and constructive ability of St. Donatus have always remained an example to members of the Church. He is still remembered in Tuscany and many boys are christened with his name in the provinces of Florence, Pisa, Leghorn and Lucca. Vincenzo Berardis, Ireland and Italy in the Middle Ages (Dublin, 1950), 108-110. 18. D. QUINTO DECIMO KAL. OCTOBRIS. 18. MOLUAINEN, of Tamlacht, in Boirche. * Moluainen is equivalent to My dear little Luan. An Irish way of saying St. Luan. The Irish used the diminutive of the name of a saint as a mark of affection and prefixed Mo-my as an expression of devotion ; the diminutives an, in, og, were often postfixed, thus the name, Aodh by this process is changed into Mo-Aodh-og (Mogue), while Luan becomes Moluainin and Molog. + An ancient poem preserved in the Martyrology of Donegal describes St. Becan when he was visited by St. Columbkille and the Monarch of Ireland, as engaged in erecting a similar structure. Were the virtues of Becan without fault. Knee bent to set a rock. Eye shedding tears, other lamentation. Rev. James O'Laverty, An Historical Account of the Diocese of Down and Connor, Ancient and Modern, Vol. I (Dublin, 1878), 26-28. 17. C. SEXTO DECIMO KAL. NOVEMBRIS. 17. 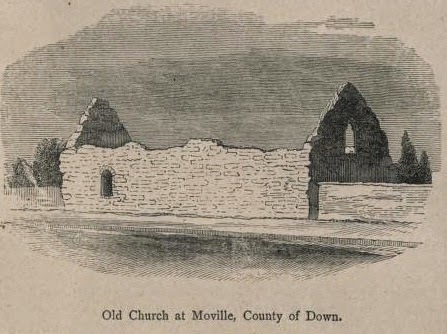 MAGH-BILE - This church, which stood a short way from the head of Strangford Lough, and about an English mile to the N. E. of Newtownards, was founded by Finian, or Findbarr [fionn barr 'white top'], as he was sometimes called,—" a flavis capillis " (Maguir). The ancient Life of St. Comgall, in the Books of Armagh and Kilkenny, speak of him as " Vir vitae venerabilis S. Finbarrus Episcopus, qui jacet in miraculis multis in sua civitate Maghbile". Marian Gorman styles him "Findianus corde devotus, Episcopus de Mag-bile'... The Annals of Inisfallen refer the death of St. Finian to the year 572. It is calculated that his church was founded about the year 540. The memory of this Finian was so much revered in the diocese of Down, that he was regarded as the patron saint of that part of Ulster. Rt Rev. William Reeves, Ecclesiastical Antiquities of Down, Connor and Dromore (Dublin, 1857), 151. Mucinis, Regulus, who was living in the time of the great St. Columb, was abbot of Mucinis, in Lough-Derg, bordering the County of Galway; his festival is held here on 16th of October. The name of St. Regulus, in Irish Riaghail, is entered in the Martyrology of Donegal, on the 16th of October: — “Riaghail, Abbot of Muicinis, in Loch Deirgdheire." He is also commemorated in the Felire of Aengus with the strophe: — “Riaghail, gifted was his career." His Acts are inserted in the Breviary of Aberdeen and he is especially honoured in St Andrew's, in Scotland, on March 30th and October the 17th. Rt. Rev. P.F. Moran, ed.,M.Archdall, Monasticon Hibernicum, Volume II, (Dublin, 1876), 223.
i. Riagail Muicindsi fa Loch derc. Alexander Penrose Forbes, D.C.L. Bishop of Brechin, Kalendars of Scottish Saints, (1872), 436-437. The first mention which we find of Kilrigmond points it out as a monastery of Irish religious, and, among other saints, the patron of Kilkenny, St. Canice, pursued there a life of holy seclusion for some time. Even St. Regulus himself is found to have been one of those Irish saints, and his name is none other than the Irish Riaghail. He was a contemporary of St. Canice, and famed in our early church as abbot of Muicinish, in Lough Derg, on the Shannon, and, like many of our saints, it is probable that he made North Britain the theatre of his missionary zeal, and closed his days at Kil-Rigmond. It was only in the year 736 that the Pictish monarch, in gratitude to God for a great victory which he had achieved, erected there a church in honour of his patron, St. Andrew, which he enriched with vast possessions, and which in the course of time became the royal and primatial church of the whole kingdom. At the time that St. Andrew's was thus founded, Kil-Rigmond had the Irishman, Tuathal, for its abbot, whose demise is recorded in the Annals of Tighernach under the year 747. Right Rev. P.F. Moran, Irish Saints in Great Britain (Dublin, 1879), 200. Note: For more on the legend of Saint Regulus see here. Various distinguished Irishmen still continued to visit foreign countries. Colman, or as usually called by continental writers, Coloman, who is styled patron of Austria, (1) left Ireland early in the eleventh century, (2) together with some other persons, for the purpose of a pious visit to Jerusalem. (3) He arrived A.D.1022 in the eastern part of Norica, now Lower Austria. Its inhabitants were then at variance with the neighbouring nations of Bohemians, Moravians, &etc. On Colman's stopping at the small town of Stockerau he was seized as a spy sent by the enemies of Austria, and thrown into prison. On the next day he was strictly examined, but although he told the plain truth, would not be believed. He was then most cruelly tortured, and at length, on his persisting in declaring his innocence, was hung from an old tree together with two robbers. While his body remained suspended from his gibbet, it continued sound and entire; and it is said that his hair and nails continued to grow. The hay or twig rope, by which his head was fastened, and even the old tree, are stated to have bloomed and revived. These extraordinary phenomena excited great attention, which was ranch enhanced by the circumstance of blood flowing from his body on occasion of a part of his flesh having been cut off for the purpose of being used in effecting a certain cure. It was now concluded, that Colman was a truly holy man, and that he had been unjustly put to death. Accordingly he was honored as a martyr, and his body was taken down and deposited with great pomp in the churchyard of Stockerau. Several miracles are said to have attested his sanctity, and Henry, marquis of Austria, was so moved by them, that he had the body removed to his residence Medlicum, alias Medlica, or Mellica, now Melck. (4) On its removal it was found entire, and was placed in St. Peter's church of that town on the 7th of October A. D, 1015, three years after Colman had been murdered. A Benedictine monastery was soon established there in honour of this saint, which has become very famous and still exists in great splendor. Erchinfrid, who has written the Acts of Colman, (5) was the third abbot of this monastery. He relates, in addition to what has been hitherto stated, several miracles wrought after his death, which it would be too tedious to repeat. He constantly calls him a Scotus, by which appellation, although he does not make mention of Ireland, or name the land of his birth, it may, considering that the Irish were then universally called Scoti, and that they were greatly in the habit of going abroad on pilgrimages, be fairly presumed that Colman was an Irishman. Erchinfrid has nothing about his having been of royal parentage, as some later writers have announced. (6) The name of this saint as a martyr is in the Roman martyrology at 13 October. (1) Colgan (A.A. SS. p. 105.) calls him apostle of Austria; but there is no reason for giving this title; for, besides Austria having been a Christian country before the arrival of Colman it does not appear that he preached there, or that he had even time to do so. Nor do I find, that Colman was an ecclesiastic. The title given to him by German writers is that of patron of Austria. The most detailed account of him is that by the abbot Erchinfrid, who was contemporary with him, or very nearly so, and which has been published by Lambecius, Commentariorum de Bibliotheca Caesar. Vindohon. Lib, ii. cap. 8. Colman is treated of also by Ditmar and other chroniclers, by Baronius, Annal &c. at A, 1012, and other writers. (2) According to Erchinfrid's account Colman's departure from his own country must have been only a short time before his death, which occured in 1012. Colgan says, (ib. p. 107.) that he had left Ireland before the close of the tenth century. I wish he had told us, where this information is to be found. (3) Baronius was mistaken in saying that Colman had been often at Jerusalem. But he had not seen the narrative of Erchinfrid. (4) Mabillon says (Annal, Ben. ad A, 1017.) that Colman’s body was buried at Melck, which he calls Mezelikim, by order of the then emperor. This is a mistake, grounded on authority inferior to that of Erchinfrid, who positively states, that Henry, marquis of Austria, was the prince, by whose order that was done. He was also wrong in assigning Colman's death to said year 1017. (5) See above Not. I. The miraculous circumstances relative to Colman's remains are attested also by Ditmar, who was bishop of Mersburg and a contemporary of his, as he died in 1019. It was, I dare say, on the authority of this ode that Baronius said that Colman was of a royal family. Dempster, wishing to make Colman, a Scotch prince, fabricated a story of his having been a son of Malcolm I. king of Scotland. To that shameless liar it is sufficient to oppose the silence of Buchanan, who, although he makes mention of more than one son of Malcolm, has nothing about this celebrated St. Colman. Harris, (Writers at Colman of Lindisfarne) remarking on Dempster's assumption, fell, as indeed some others had before him, into a strange mistake, confounding Colman of Austria with the one of Lindisfarne. He did not know that the former was killed in 1012, whereas the latter lived in the seventh century. Rev. J. Lanigan, An ecclesiastical history of Ireland, from the first introduction of Christianity among the Irish, to the beginning of the thirteenth century, Volume III, (Dublin, 1829), 440-441. 12. QUARTO IDUS OCTOBRIS. 12. BECC, son of De, son of Gnoe. He was of the race of Colla-dachrioch, and a celebrated prophet. There dwelt at some distance from the house of Finnlugh, a certain rich man, whose name was Airde (5), son of Fidach. At this time there came to his mansion a chief prophet of Erin, whose name was (6) Becc MacDé; Airde inquired of Becc, "What, unknown event was soon to happen there ;" and Becc answered: " There will be born this night, between you and the sea, your true and worthy king, whom many kings and princes will devoutly honour, whom he will bear with him to heaven." 5. — Airde MacFidaigh. The mansion of this "brugaid" (great farmer) in which St. Becc was entertained when he prophesied the birth of Brendan, stood on the crest of a verdant knoll or hillock in the townland of Listrim, adjoining the parish of Ardfert, commonly called Cahirard (stone fortress on the height), but which, an accurate map of the locality, more than three hundred years old, shows to be Cahirairde (fortress of Airde). From this Fenit lies due west, "between it and the open sea according to the prophecy of St. Becc, as given in the Book of Leinster: " this night thy king is born between thee on the west and the sea." On the top of this hillock can be easily traced at present the ring of the foundations of the Cathair, which crowned its swelling slopes, showing a diameter of more than one hundred feet inside the walls, which must have been at least seven feet in thickness at the base; but of those walls, and of whatever buildings lay within them, not a stone remains in situ, all having been drawn away for building purposes during many generations. But nothing can efface the tokens of early and long occupation of the surface all around its site, for its emerald verdure, which in early summer makes it conspicuous in the landscape for many miles in all directions, can only be accounted for by its uses for man's habitation for long centuries. 6. — St. Becc MacDé. The Annals of the Four Masters record his death: "The age of Christ, 557; the nineteenth year of Diarmid; St. Becc, son of Dé, a celebrated prophet, died." His name is on the Calendars of Irish Saints for October the 12th, on which his festival was kept. He was son of Dé-Druad, sixth in descent from Mainne, son of Niall of the "Nine Hostages." There is no other reference, as far as I know, to his visit to Kerry, save what we find in the Lives of Brendan; but we may well believe that many of the early saints, such as he, came to Kerry, after St. Benignus, to visit the Christian converts there, and to promote the spread of faith and piety amongst them. Rev. D. O'Donohue, Brendaniana: St. Brendan The Voyager In Story And Legend (Dublin, 1893), 7-9, 41-42. R.A.S. MacAlister, ed. and trans, The Latin and Irish Lives of Ciaran, (London and New York, 1921), 69. Dermot went to Tara and again said to Beg : "let me have certain knowledge what manner of death it is that shall carry me off." Beg said: "that is not matter of doubt: — "in Beg's rath thou shalt drink a malt-drink of a single grain ; and there it is that thou shalt be laid, Dermot." "Be our magicians brought to us," Dermot said, "that we ascertain whether it be the one thing that they and Beg forbode for us." "He doubts me does he," says Beg; and thereupon in great anger and in vindictive dudgeon goes out from Dermot, having after him a great crowd that begged of him a prophecy, and so on until he saw Columbkill that awaited him. He saluted him, and Columbkill said: " it is a marvellous prophecy; from God comes this great foreknowledge that is vouchsafed thee." "God we thank for the same," Beg answered. Columbkill enquired then: "knowest thou thine own death's day ?" "Cleric, I know it well," quoth Beg : "there are yet seven years of my life." "That is a grand thing for him to whom it is so done; if indeed it be true," said Columbkill. "It is not true," Beg said: "there are but seven months of my life." "Good again, if it be true," said Columbkill. "It is not true," Beg said : "there are of my life but seven hours of the day — speedily let me have communion and the sacrifice!" Then the cleric tonsured him, gave him communion and sacrifice, and he went [presently] to Heaven. Now it had stood prophesied for Beg that before he attained to death he must utter three falsehoods [as above]; for up to that hour he never had told a lie. For the same reason also it was that Columbkill sought him out, for he knew that in that day he had to die incontinently. 'Death of King Dermot' in S.O'Grady, ed. and trans., Silva Gadelica (I-XXXI), Volume II (London and Edinburgh, 1892), 85-86. I have also included the vignette on Saint Colum Cille and the death of Saint Becc at my other site here but have taken that account from a different source. St. Canice or Kenny, founder of the Abbey, and patron of the parish, of Aghaboe, was born in the year 515 or 516, in Glengiven, in the region of Cianachta, in the present County of Londonderry. He was descended from the Corco-Dalann or Ui Dalainn, a tribe whose ancestor, Dalann, is traced back to Fergus (King of Ulster a little before the Christian era), son of Ross, son of Rudhraighe. The Corco-Dalann were of little consequence, and their exact location is unknown, except that they dwelt in an island called in the Saint's Life "Insula Nuligi," and which is usually identified with Inis-Doimhle or Inis-Uladh, now the Little Island, in the Suir, south-east of Waterford. Lughadh Leithdhearg, our Saint's father, was a distinguished bard, and from the wandering disposition of men of his class, it is not difficult to conceive how he left the home of his youth, in the sunny south, and settled down in the far north, under the favour and protection of the chief of Cianachta. He was there chosen tutor or foster-father of his chieftain's son, Geal Breagach (Latine Albus Mendax), who afterwards succeeded to the headship of his tribe. The mother of the Saint was Maul or Mella. She attained an eminent degree of sanctity, and the church of Thompleamoul, otherwise “Capella Sanctae Maulae seu Mellae," beside Kilkenny city, was dedicated to God under her invocation. In early life, St. Canice was employed, in his native place, as a shepherd in charge, probably, of his chieftain's cattle ("in illo autem loco sanctus puer Kannechus pecora pascebat"); but, being a youth destined by God to promote the glory of His name, he soon abandoned that peaceful calling and placed himself under instruction in some of the schools with which the country then abounded. A curious mistake in reference to his early education, needs to be noticed here. Most, if not all, of his biographers state that at a very early age, when only about fourteen years old, he was sent to Britain to be educated, and that he remained there till after his ordination, on attaining his thirtieth year. Such a statement seems, at first sight, improbable, and, on examination, will be found inadmissible. For St. Canice and St. Columbkille were pupils together, at Clonard, under St. Finnian, in 543, when St. Canice was only twenty-seven or twenty-eight years of age; and again, in the early part of 544, the same two saints, either with St. Kieran of Clonmacnoise and St. Comgall of Bangor, were students in the School of Glasnevin under St. Mobhi. Hence, there can be no doubt that the Saint's education was received in Ireland, and that it was only when St. Mobhi's School had to be disbanded, owing to the breaking out of a pestilence, of which St. Mobhi himself died, Oct. 12th, 544, that St. Canice, then twenty-eight or twenty-nine years old, left his native land and sought the friendly shores of Britain to perfect himself in sacred knowledge and prepare himself for his ordination to the priesthood. "Proceeding to the monastery of Llancarvan, situated in Glamorganshire, on the banks of the Severn, he placed himself under the care of its holy Abbot, St. Cadoc, sumamed the Wise, who at this time enjoyed a wide-spread fame for sanctity and miracles. Among the exercises to which Canice applied himself, under the guidance of this holy Abbot, we find specially mentioned the transcribing of the sacred Scriptures; and it is also commemorated that, though he was remarkable for the practice of all virtues, yet he was particularly endeared to the venerable Cadoc for the promptness of his obedience. One day, we are told, whilst engaged in copying, the monastery bell summoned him to another task. The obedient Canice left half-finished the letter o at which he was engaged, in order to hasten at once to the duties to which obedience called him. ' Thenceforward,' adds the biographer, ' the abbot loved Canice exceedingly.' "
Having received the holy order of priesthood, on the completion of his thirtieth year, in 545 or 546, he set out for Rome to pay homage to the reigning Pontiff and secure his blessing at the outset of his missionary career. On his return, probably about 550, St. Canice went to his native place, where he denounced the superstitions, and exposed the delusions, of the druids. who still lingered in secluded parts of Ireland. The reputation acquired by his first work was increased by subsequent visits to his home during his long life ; for he often passed there in his frequent voyages to Britain, especially to his friend, S. Columbkille. In the house of his sister, Columba, at Airte, near the coast beyond Glengiven, he cured St. Berchan, who afterwards founded the church of Clonsast, in the King's County. He also converted his foster-brother, Geal Breagach, the chief of Dungiven, who at first ridiculed his admonitions, but, terrified by an extraordinary illness, at length repented, and assisted in founding at Dromachose, in Londonderry, a church, where, for more than a thousand years his spiritual benefactor. St. Canice, was honoured as patron. Animated with that wonderful missionary spirit, which characterized so many of his countrymen, the saint is next met with, in 565, in Scotland, whither he had gone to aid St. Columbkille in the conversion of that nation. With St. Comgall he accompanied St. Columbkille, in that year, on the memorable occasion of his first visit to Brude, the pagan King of the Picts. During his sojourn in Scotland, St. Canice " erected an oratory on Tiree Island, and the ruins of an ancient church, still called — Kil-Chainnich, probably mark its site. He also erected cells in the Islands of Ibdon and Eninis (i.e. ', Island of Birds), and his memory was cherished there in after times. He was honoured even in Iona, where a burial ground still retains the name Kill-Chainnech. On the mainland he built for himself a rude hermitage, at the foot of a mountain, in the Drumalban or Grampian range, and we meet at the present day, fully corresponding to this description, towards the east end of Loch Laggan, the remains of an ancient church called Laggan-Kenney, i.e., St. Kenny's Church at Laggan. He founded also a monastery, in the east end of the province of Fife, not far from where the river Eden pours its waters into the German Ocean. This place was then called Rig-monadh or the Royal Mound ; and when in after times the noble Cathedral of St. Andrew's was erected on the site thus hallowed by the Irish saint, we find that it continued for centuries to retain its Celtic name of Kilrimount, by which it is designated ji the early charters. In many other places St. Canice seems to have erected cells or oratories. Of Maiden Castle in Fife, Boece writes that in his time the remains of the great enclosed monastery, in which the religious brethren of St. Canice had lived for centuries, could easily be traced. Indeed, so many places retain his name and cherish his memory that Scottish writers have not hesitated to prononnce him, after St. Brigid and St. Columbkille "the favourite Irish Saint in Scotland." His first Irish foundation was in all likelihood, that of Dromachose, otherwise Termonkenny, in his native Cianachta, the abbots of which are referred to as the Coarbs or " successors of Cainneach in Cianachta." His next foundation appears to have been at the place, called after him, Kilkenny West, in the County Westmeath. A turbulent King of Meath, Colman Beg MacDiarmaid, slain in the year 571, carried off by violence a nun, sister of St. Hugh MacBric, Bishop of Killair. The Bishop, according to the custom of those times, took up his position near the lake in which his sister was held prisoner on an island, and there fasted against the King, demanding redress of the grievous wrong that had been done her. St. Canice came to his assistance, but the King, hearing of his approach, ordered the boats to be drawn up and all avenues to his castle to be closed. St. Canice coming down in the night, passed over the lake and entered the castle. The King struck with terror at a chariot of fire which he saw moving towards the island, confessed his crime, delivered up the nun to her brother, and made a grant of that island and castle to St. Canice, who dwelt there and established a church. The lake (called Stagnum Rossum in the Latin Life of our Saint), if not that now called Makeegan, is probably one of those in Lough Ree, or the arm of the Shannon to this day included in the parish of Kilkenny West. Some years later, in winter, S. Canice, travelling in Breffny, rested at a cross in Ballaghanea, parish of Lurgan, Cavan, before which he performed the devotion of None. Inquiring whose cross this was, he was informed that it was here Colman Beg Mac Diarmaid had fallen in battle. ' I remember,' said St. Canice, ' that I promised him a prayer after his death,' and turning his face to the cross he prayed with tears, until the snow and the ice melted around him, and he delivered from torments the soul of Colman Beg." The precise date of his great establishment at Aghaboe cannot be determined, but Dr. Lanigan shows that it cannot have been later than 577. According to an Irish Life of St, Finbarr, of Cork, published, with English translation, in the Cork Archaeol. Journal of April, 1893, Aghaboe was first selected, as a religious site, by that Saint, but he afterwards surrendered it to St. Canice, whom also he assisted in founding the original church and enclosing the graveyard there. Although reference has been already made to a notable service rendered by our saint to his friend, Colman, King of Ossory, a more extended notice of the same may be given here. Colman came to the throne of Ossory in 582, in succession to his father, Fearadhach. He was one of the Corca Laighdhe or Munster Kings, who long held usurped sway in Ossory, and his reign was disturbed by violent opposition, on the part of the old natives of the territory. On one occasion he was closely besieged in his fortress, probably at Kells, Co. Kilkeimy, by the disaffected Ossorians, under the command of two of their chiefs, Maelgarbh and Maelodhar. St. Canice, in his church at Achadhbo, being made aware of his friend's plight, set out on foot (nec currum nec equum habens), southwards, to his relief. "As Canice proceeds in the chariot through Magh Roighne (per campum regni), he is met by the portly Abbot of Domhnach-mor, in [Magh] Roighne (pinguis princeps Domnich Moir Roigni), a bitter enemy of the King. Addressing the saint, with an air of assumption, he said : ' I know that you are hastening to liberate your friend, Colman, but it is to no purpose, for you will find him already slain and his body consumed by fire.' ' The Son of the Virgin knows,' replied Canice, ' that what you imagine is not true, and before you yourself return to your cell (cellam) you shall die.' And it happened accordingly; for as that portly personage, while seated in his chariot, was passing through the innermost gate of his monastery (suae civitate), the portcullis (valva quae dicitur Domlech) fell down on his head and killed him on the spot. St. Canice, hastening on in his chariot, with all possible speed arrived at King Colman's castle, which was surrounded by a great multitude [of enemies], and was already given to the flames. Then Canice entered the castle, through the flames, and, by the power of the Lord, unseen, and unknown by all, brought forth the king from his perilous position, through the crowds [of enemies] and their spears. Having led him a long distance from the castle, the saint said to him : “Stay here, and, although you are alone today, you shall not be so tomorrow ; for three men will come to you the first day, three hundred the second, and on the third day you will be again King of all Ossory.' And it happened accordingly." St. Canice exerted himself strenuously in withdrawing his countrymen from the barbarous customs handed down by their forefathers. On one occasion, whilst travelling through West Leinster, he found the people assembled, with their King, Cormac Mac Diarmaid, to enjoy the gruesome spectacle of a little boy, named Dolne, being subjected to the torture called Gialcherd. The Gialcherd consisted in casting young children high up in the air and receiving them in their fall on the points of lances held upright. On the Saint's arrival at the place of meeting, the spears were already fixed upright in the ground in preparation for the ghastly exhibition. He earnestly remonstrated with the King, and besought him to spare the little boy, but in vain ; and savage custom would have had another victim had not Almighty God, at the prayer of the Saint, miraculously saved the child who, when flung on the spears, was neither killed nor injured. However, the terror of the horrible death from which he had been thus preserved, had the effect of distorting his eyes, so that he was called thenceforward Dolne Lebdearc, i.e. Dolne of the crooked eyes. In after life he became famed for his sanctity, and founded a church, (round which grew up a town), called from him Kill-Dolne. Desiring to be alone with God as far as possible, St. Canice frequently retired from the society of men, and even from the companionship of his own brethren, and betook himself to some remote solitude for prayer and meditation. One of his retreats, in a wood " with the angels," was known only to a little boy who used to recite the Psalms with him; but the monks watching this companion going out at night, were guided by a brilliant light which they saw preceding him, and shining with additional lustre over the spot where the saint was concealed. His favourite retreat was the Insula Stagni Cree, Hibemice Inis Locha Cre, now called Monahincha, or the Holy Island, a mile or two beyond the bounds of Ossory, and about the same distance from Roscrea. Here he fasted forty days together; here he transcribed the Gospel, and wrote a Commentary thereon, which was preserved for centuries and was known as the Glas Chainnigh, the Catena or Commentary of St. Canice ; and here, too, he acquired the remarkable eloquence that once elicited the warmest commendations of St. Columbkille, in Iona : " Who, O Canice," said Columbkille, after hearing one of the Saint's sermons, " gave you this wonderful knowledge of the Scriptures ? " " The Son of the Holy Virgin himself," said Canice, " Who, when I was in Inis Locha Cre, near Sliabh Sinoir " [now Slieve Bloom] " in Ireland came to me, and with Him I read the Gospel, and He Himself taught me its meaning." It was owing to his eloquence that he was likened, by the old hagiographers, to St. Philip, who was traditionally honoured in the early church as the most eloquent of the Apostles. He was small of stature, as already remarked, and very bald ; and hence, those who opposed themselves to his zeal, but whom his great charity afterwards gained over to God's service, used to call him, in derision, " baculatus modlcus " and " calvus baculatus," i,e., the little man, and bald-headed man, of the [pastoral] staff. His early biographers make no mention of the Saint's connection, while living, with any religious establishment on the site now occupied by the Round Tower and Cathedral of St. Canice's, in Kilkenny city; yet the constant tradition of Upper Ossory leaves little room for doubt that he founded and presided over a monastery there. Aghaboe was. however, his greatest foundation, and here his closing years were mostly spent. Here he could enjoy the society of St. Fintan of Clonenagh, who lived but a few miles away, and of St, Brendan of Birr and St. Mochaemhog or Pulcherius of Liath, three of the most distinguished ornaments of the monastic institute in Ireland, with all of whom he lived in the closest bonds of religious intimacy, and to whom he frequently paid visits, as their Lives attest. With such friends he had, in all the afflictions of life, a foretaste of those heavenly joys to which in the fulness of days he was at length summoned. In the year 599 or 600, he breathed his last in his Abbey at Aghaboe. " As the day of his departure drew nigh," writes his biographer, " his whole body became infirm. He would not, however, receive the last rites from any of the monks of his own monastery (familia), saying that God would send another to administer to him the Body of Christ. Then St. Fintan [surnamed Maeldubh, of Clonenagh] came to him by God's appointment, and receiving the Holy Eucharist at his hands, he departed to the Lord." A.D., 600, "Quies Caindech, Achaigh-Bo-Cainig, qui lxxxiiii etatis suae an. quievit." 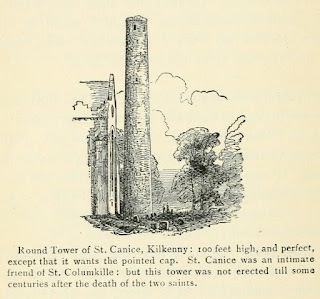 William Carrigan, The History and Antiquities of the Diocese of Ossory, Vol II, (Dublin, 1905), 26-33. Professor Pádraig Ó Riain, in his 2011 Dictionary of Irish Saints reveals that the saint is associated with the County Kildare locality of Killelan, probably originally Ceall Ghialláin. The Giallán of this place is described in a scribal note found in the Martyrology of Tallaght at October 2 which refers to a Leinster prince called Oinmhe, a hostage with Saint Brigid of Kildare. He is then renamed Giallán, from the Irish word for a hostage giall. October 2 seems to be the main commemoration of Saint Giallán, but his name is recorded on September 6 in the Martyrology of Tallaght, although this is the only Irish calendar where it appears on this day. Onme (i.e. simul) or Omne son of the king of Leinster. And he was given as a hostage to the king of Leth Cuind, and he gave him into Brigit's hand that she might on his account obtain submission a patre suo, et aliquo die dixerunt discipulae Brigitae ei: ' 'tis lovely the little hostage (giallán) is to-day,' said they. 'Giallán will be his name for ever,' said Brigit. And that is the one who is in Cell Giallain in Ui Muiridaig. It seems that the little hostage made quite an impression on Saint Brigid and her household!